Well, we are over 2 weeks into the new year and how many of you have kept your resolutions so far? We all have to admit there are a few that have not been so easy to keep. How about the goal of watching what we eat? It sounds easier than it really is, doesn't it? Keep us in mind each week as we put together made-from-scratch specials that are both good for you and taste amazing as well. We have even been tossing around the idea of putting a list of menu items together on one page in our menu that fit both these desires. We may even call it the "resolutions" page of our menu. (Stay tuned for more on that in the near future.) For the time being, here are a few specials we have right now that should keep you close to your goals. This is not your grocery store, factory made hummus. Chef Chris takes fresh cooked, mashed chick peas and blends it with tahini, olive oil, lemon, garlic and a touch of salt. Tahini is a paste made from ground hulled sesame seeds. This dish screams nutrition. It's a great source of protein, along with being high in iron and vitamin C. You need some sort of shovel to enjoy this dip, right? We have that taken care of with fresh fried taro chips. Taro is a root vegetable that we slice thin and lightly fry to a crisp chip. Taro has a nutty flavor that is similar to a water chestnut. 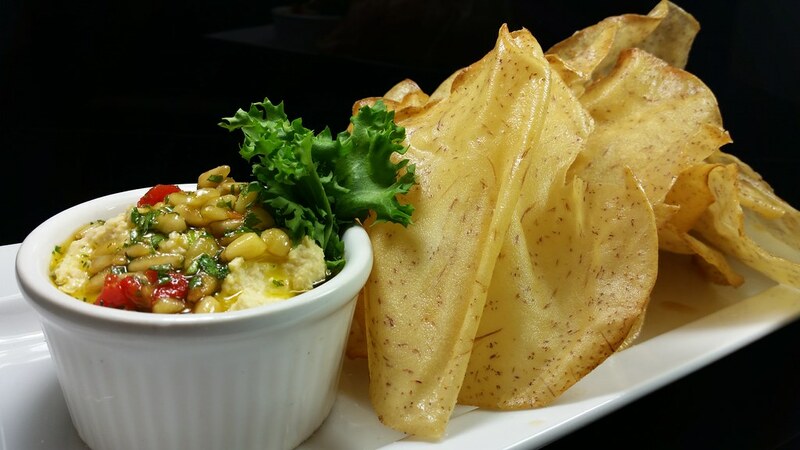 Our housemade hummus is topped with pinenuts, red pepper and an olive oil blend. This salad combines great flavor with "good for you." Salmon is a terrific source of protein, along with vitamin B12, phosphorus and B6. Cold-smoked salmon is the feature of this dish, but what a wonderful combination with the rest of the ingredients! Arugula is a low calorie, peppery green that's full of anti-oxidants and vitamins. This leafy vegetable is becoming more and more popular these days. Boursin is a creamy, garlic and herb cheese that we have panko crusted and lightly fried. 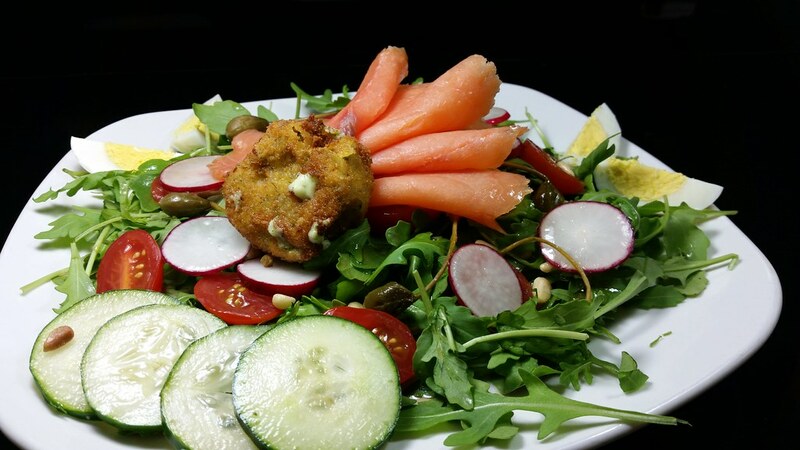 Our salad is finished with an assortment of radish, hard boiled egg, cucumber, tomato, pinenuts and caperberries. Caperberries are oblong, semi-green fruits, about the size of or slightly larger than a table grape. Though they still have some lemon taste, they are much milder than caper buds. This has been one of my go-to healthy meals the last week or so. Our chefs sauteed fresh asparagus, tomato, carrot and zucchini in white wine and plugra butter. It is then combined with several nutritional grains. 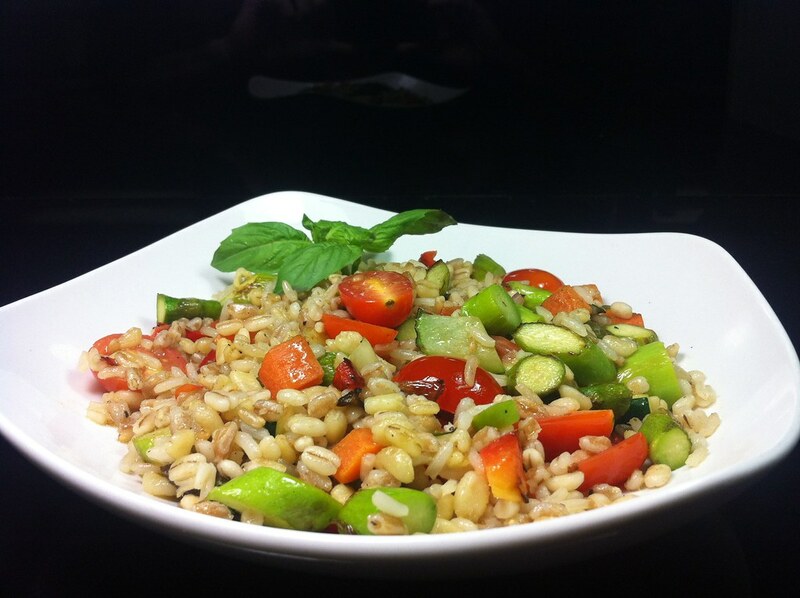 Farro, barley, durum and whole grain oats are packed with a lot that is good for you. This dish can be enjoyed complementing your meal or as the main dish itself for a light lunch. I recently topped it with a our salmon burger, although the possibilities are endless! Try it with our black bean veggie burger or our housemade crab cake. Keep us in mind as you plan your meal this week. Stick to those resolutions and remember the many different healthy options to choose from. You might even say that our menu offers more healthy choices than most places have choices.